(CNN) -- When David Halberstam wrote his 1979 book, "The Powers That Be," about four powerful news organizations and how they shaped the national dialogue, he focused on three print publications -- Time magazine, the Washington Post and the Los Angeles Times -- and one television network: CBS. 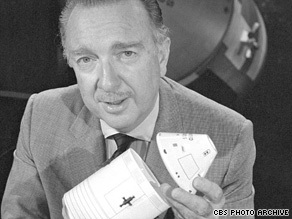 Cronkite's enthusiasm for the space program was evident in his broadcasts. The reason for CBS was obvious. The "Tiffany Network" had the most renowned television news division in the country, and its heart, soul and face was the man whose carefully modulated tones defined its propriety. That man was called -- without irony -- "the most trusted man in America." In the splintered, frantic, snark-happy, 500-channel multimedia universe in which we now live, it's hard to imagine one man with the kind of almost universal regard Cronkite, who died Friday at the age of 92, had in the 1960s and '70s. In retrospect, Cronkite seemed a little taken aback by his status; in his 1996 memoir, "A Reporter's Life," he is consistently self-deprecating and rarely fails to mention a writer, producer or CBS staffer who helped him nail a story. But his power was undeniable. In those years, there were only three networks splitting the national television audience, and CBS was No. 1 for news, as it was in prime time. Cronkite did not take his role lightly. He delivered the news with care and consideration and humanity, never far removed from his declarative sentence, wire service and radio announcing roots. See photos of Cronkite's career ». Most famously, when he went to Vietnam in early 1968 and said it was time for the U.S. to start getting out, he "change[d] the balance," wrote Halberstam. "This affected [President] Lyndon Johnson in two ways," Halberstam continued. "First, he realized that he had lost the center, that Walter both was the center and reached the center. ... Second, because he liked and admired Cronkite so much and thought him so fair a reporter, he found himself believing that if Walter Cronkite was reporting these things, he must know something." Less than two months later, Johnson announced he would not seek re-election. Cronkite's status made him an occasional target, of course. To Richard Nixon -- whom Cronkite found a curious man, once scanning a ceiling as if looking for surveillance bugs -- he and CBS were the enemy. To competitors, Cronkite was a challenge, whether answered by David Brinkley's acerbic wit at NBC or Barbara Walters' glamour at ABC. But, even as the "avuncular" -- he was always described as "avuncular" -- "Uncle Walter," Cronkite never lost his authority. In a country, then as now, with diverging, contradictory interests, he was a man of wide support. In real life, of course, we now have dozens of networks and countless news sources. Cronkite stepped down as anchorman in 1981; he would say later he regretted the decision. He never ceased to promote the need for solid, well-sourced news, nor was he quiet when he felt that trust was being eroded. But regardless of his qualms, he never ceased loving journalism, a career he treated like a gift. He was along for the ride of history, and he enjoyed every minute.